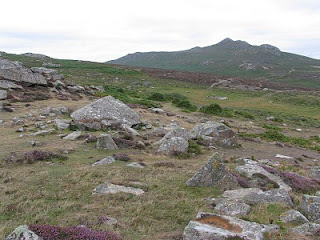 Recent archaeological fieldwork on the slopes of Carn Menyn in the Preseli mountains in south-west Wales have identified the likely quarry sites for the bluestones erected at Stonehenge, the World Heritage site in Wiltshire. "The bluestones hold the key to understanding the purpose and meaning of Stonehenge." Recent excavations have shown the intended layout of the bluestones at Stonehenge (see English Heritage Timewatch video). The bluestones are as important to the people of Pembrokeshire as the Rosetta Stone is to the people of Egypt. We are not asking for all the stones to be returned: just the one. And a generous sponsor has agreed to make a copy for display at Stonehenge; nobody will know the difference. The bluestones have a more appropriate context in the wilds of Salisbury Plain. More motorists see the stones from the A303 as they travel to the West Country than there are walkers in the Preseli Mountains. They are an integral part of the Wiltshire landscape. Full details of the Cairo conference will be issued shortly. Thank you for bringing this weighty (in more ways than one!) matter to our attention, I have taken the liberty of commenting on my own blog. I find it telling that people like Cultural Property Observer are all too willing to criticise measures taken to preserve the heritage in their homeland when the people involved are Gentlemen of Darker Complexion but less willing to draw attention to these issues when it is being contested within white European nations. I'd be surprised if anyone in the collecting blogger community has any critical coverage of this issue, but we'll see.